My woes with the P2V conversions is growing ever since I posted last time! Just an update on couple of things I learned in doing so. First would like to mention an error while specifying source computer to Standalone Converter; it would return the following error. Run CMD Prompt as administrator. The source computer has GPT disk(s). Conversion of live computers with GPT disks is not supported. Conversion of virtual machines with GPT disk is supported only if disk-based cloning is performed. This will give you a list of the partition configured with GPT (indicated by *). Now goto Server Management > Disk Management and make the specific partition OFFLINE (Do note its capicity). Verify the partition which you just turned OFFLINE by right clicking on the Disk Device > Properties > Volumes > Populate. You can verify it from the Capacity parameter. Click OK.
Now right click on this Disk Device and click DISABLE. After doing this again run the P2V conversion process; it will work like a charm! Hopefully 🙂 !!! VMware Standalone Converter 5.1.0: Error: Unable to obtain hardware information for the selected machine. With updating of VMware Infrastructure to 5.1; I also installed the latest Standalone Converter 5.1.0. While doing P2V conversions with Windows Server 2008 R2; I faced a few problems. I made sure to follow the checklist given on VMware KB 1016330 but to no avail. Hence reverted all the changes I did according to the given list. With Converter 5.0 Build 470252 (as used that version previously with success but with vCenter 5.0): Surpassed the initial error but when pointed to my vCenter 5.1; the Converter would stop responding and get crashed. I then finally resolved the issue by using Converter 5.0.1 Build 875114. Worked like a charm! VSS Shadow Copy service on source machine does not need to be on. Third Party antivirus or backup services on source machine need not to be stopped. Simple file sharing on source machine need not to be disabled. Once you are done with installation of VMware vCenter 5.1; you will notice that vSphere 5.1 client wont let you login into your vCenter Server. 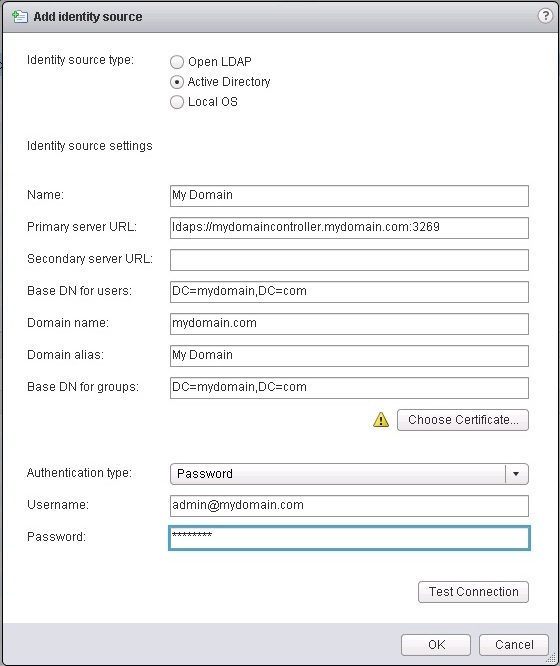 Either you will need to configure a local admin ID on your vCenter Server or if you have an active directory (AD) running in your environment; you will need to link that to your vCenter Server i.e. by configuring an identity source. During installation of vCenter Single Sign On 5.1; it tries to add the identity source but in my case resulted in error (Error 29155.Identity source discovery error). I then found out its the case with other users as well and also was pointed out in VMware in their KB articles. The workaround for the issue given was to add the identity source manually. Doing so I got the following errors. These errors are due to the fact that your AD is configured to communicate over LDAPS SSL connection. Hence to register your identity source; you will need the X.509 certificate of your AD domain controller (DC). 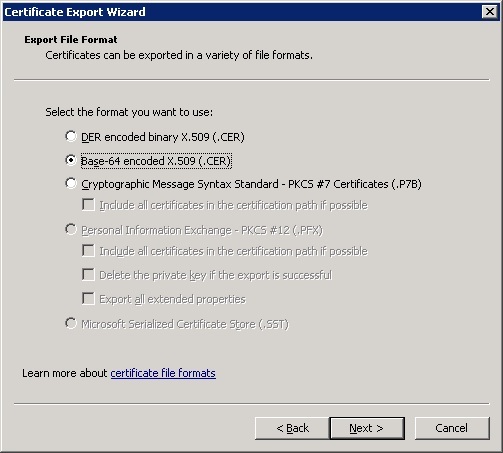 For that export the certificate of your AD but make sure its the Base-64 X509 Certificate. Once imported; again add the identity source as demonstrated below. Once you chose the certificate from Choose Certificate tab; make sure you get the following confirmation. If not there must be something wrong with your certificate. You can click on Test Connection to verify your AD connectivity. Your vCenter, vSphere, vSphere Web Client, vCenter SSO etc must all be installed in the same default directories. Do add the port 3269 with your FQDN. There must a proper forward and reverse pointer entry on your DNS for your vCenter Server. If your domain controller is behind a firewall; make sure you have configured a policy to allow vCenter traffic. I am not a database guy and always have avoided anything related to it. When installing VMware vCenter 5.1 or earlier; you are prompted to create a DB instance. You can carry on by creating a default instance of SQL Express (zero effort required; YES I have always done that). But doing so is not recommended in a production environment as the DB gets populated and there are limited options to purge/protect your logs. 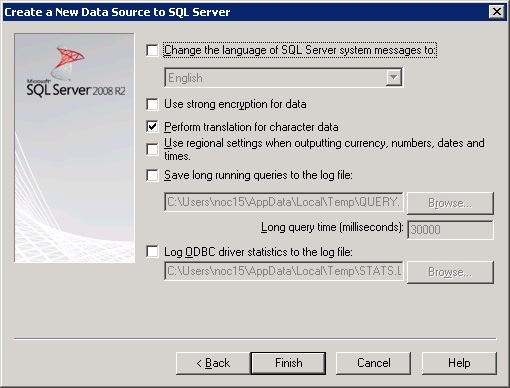 Hence installation of separate SQL server is recommended. For a dumb person like me VMware is kind enough to include scripts for the DB creation and permission rights are available in the setup package but I found that customization was required. Hence for all the linked-minded fellows out there; this post might be of some help. There are basically two DB’s needed to be created. One for the vCenter and other for the vCenter Single Sign On (SSO). VMware has made a major change in vCenter 5.1 for with its mandatory to install the SSO module. 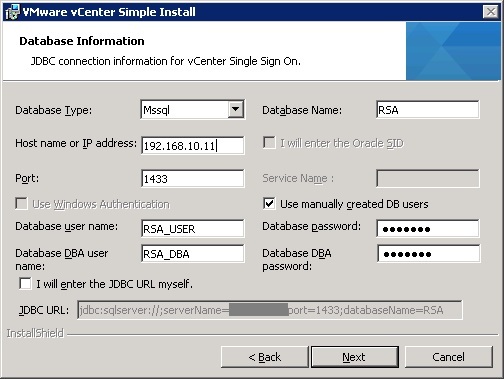 Once done with this; make sure to create the ODBC SYSTEM DSN for the vCetner DB (VCDB). Following are the steps to create the SYSTEM DSN. 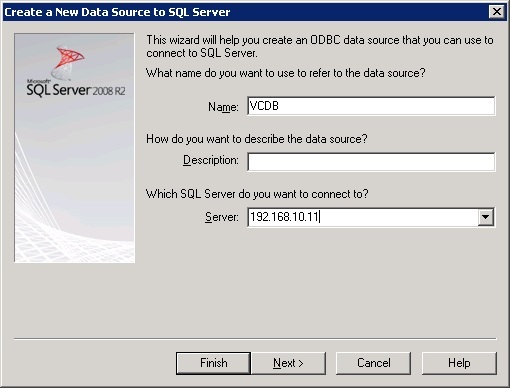 Go to ODBC DATA SOURCE ADMINISTRATOR from the Control Panel. Click the SYSTEM DSN tab from the top. Click ADD. 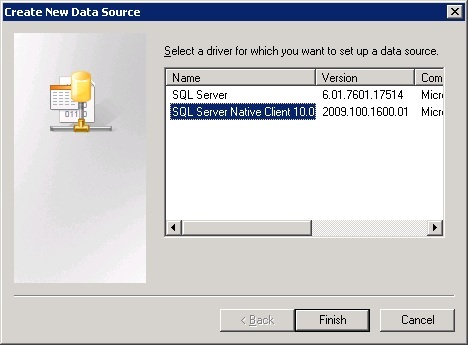 Double click SQL NATIVE CLIENT. Enter the NAME for the data source and the IP of the DB Server. Click NEXT. 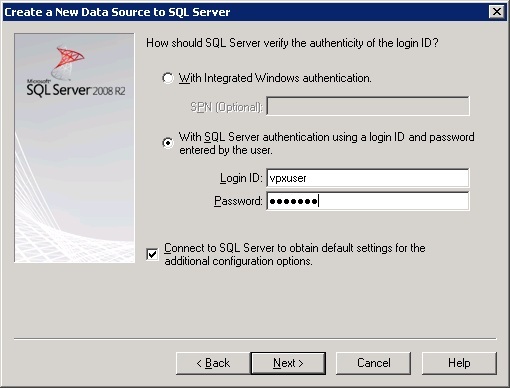 Select the SQL SERVER AUTHENTICATION OPTION and give the user (default: vpxuser) credentials (you provided in VCENTER_DB_CREATION_SCRIPT). Click NEXT. 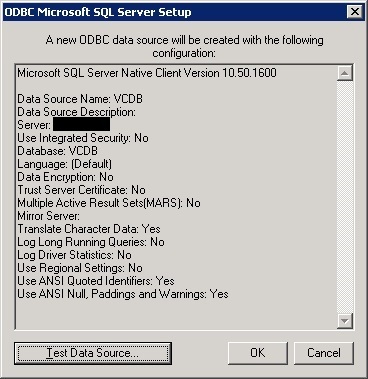 Make sure that VCDB database is selected in the CHANGE THE DEFAULT DATABASE TO tab. Click NEXT. Leave the default settings and click FINISH. 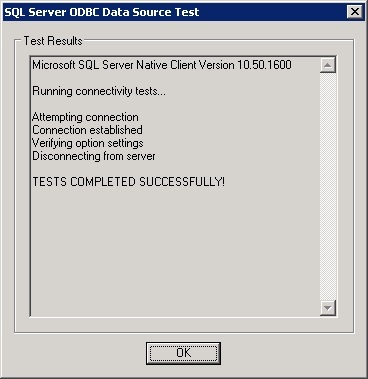 You can verify your DB connectivity by clicking TEST DATA SOURCE. After doing this; you can now proceed with your vCenter installation. Start the installation by clicking the vCenter Server Simple Install from the vCenter Setup Wizard. 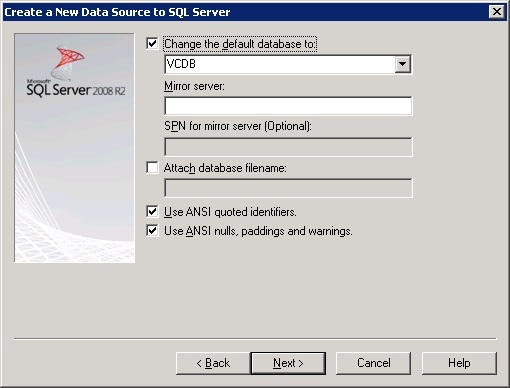 During the SSO installation you will be asked to provide the DB details as illustrated below. Provide the credentials you created in script SSO_RSA_DB_CREATION_SCRIPT_2. When the SSO and vCenter inventory setups get completed; the installation for the vCenter Server will begin. During the setup you will be again asked to provide the DB details. 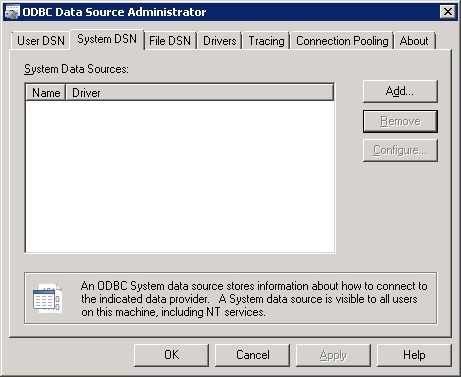 Select the radio tab for USE AN EXISTING SUPPORTED DATABASE and select the already created SYSTEM DSN (VCDB). Make sure to enter the credentials you entered while you creating the SYSTEM DSN. 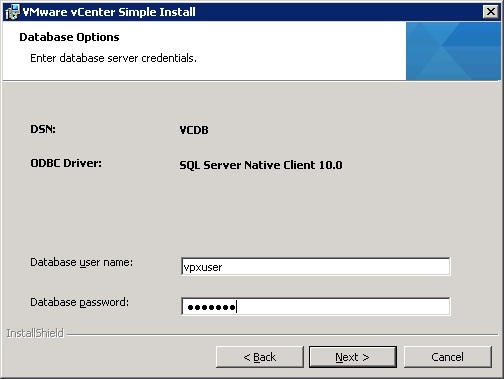 Thats all you need to configure the DB’s for your vCenter installation. I am personally done with my installation but now am stuck on a couple of up-gradation issues from 5.0 to 5.1. Hence in my next blog I will be writing on those issues.